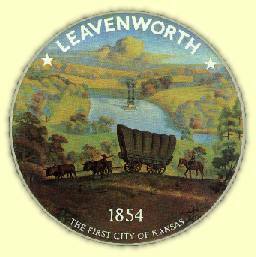 Leavenworth, the "First City in Kansas," established in 1854 is located on the west banks of the Missouri River. It became nationally known as the "jumping off point" for the opening of the west. Buffalo Bill Cody spent part of his youth here and later worked in the area as a Pony Express rider and Army Scout. Cody's parents are buried here. Leavenworth has numerous historic vintage homes, sites, depots, and of course, the "Big House", the United States Federal Penitentiary. The Victorian Carroll Mansion, open daily to the public, was built in 1867. The mansion boasts magnificent woodwork and beautiful stained glass windows. Shop in the many antique and unique shops in the Historic Riverfront Downtown. Leavenworth, the "First City of Kansas", invites you to take a walk back in time and explore the history of "Where the West Began" by visiting our Historic Wayside Tour. The museum houses collections of early frontier memorabilia and artifacts including buggies and cutters manufactured in Leavenworth. There is also a mock-up of the United States Penitentiary, plus other prison memorabilia. The River Connection Tour is a great way for you and yours to spend a couple of days or a family weekend. A multitude of interesting historical attractions, sites and experiences are available daily and spending more than a day is a definite must to capture the true flavor of our communities. Eisenhower Dept. of Veterans Affairs Medical Cntr.